One of the best things about being a beer writer is being able to call breweries up and ask if you can visit, knowing they are most likely to say yes. Even better is getting the inside story on them and their beers and, effectively, a tutored tasting with the brewer. And so it came to pass that I headed east to visit Wayland’s Sixpenny Brewery near Blandford Forum* for a feature on dark beers I was writing for Dorset magazine (in the Feb issue, out now!). I had to drive more than 100 miles to get there but, man was it worth it. Initially it was their 6d Black (4.4%) I was interested in. This honey porter fitted nicely into what I’d got planned for my feature and turned out to be my favourite beer of the selection I’d chosen to write about. It looked great, dark with chestnut hues and a nice creamy head which brewer Scott Wayland told me is retained thanks to the inclusion of a little wheat malt which also increases the beer’s mouthfeel and fullness of palate. It lived up to its appearance, tempting me with its coffee aroma and then satisfying me with a dry, chocolatey flavour reminiscent of a truffle, and a good astringent finish. I could have drunk it all day – had I not been driving. Pale bronze in colour, it had an aroma of grass clippings, melon and lychees and – although some hate the use of this word to describe how a beer tastes – a complex hoppy flavour with a pronounced bitter finish leading to a subtly sweet, with elements of barley sugar and toffee apple, aftertaste. Despite this positive carnival of taste sensations it also had a mellow quality that made it easy to drink and tempered the flavours so they didn’t overwhelm. Sixpenny IPA to take away! It’s probably no wonder then that it won Weymouth Octoberfest and took Beer of the Festival at Salisbury Beerex last year. 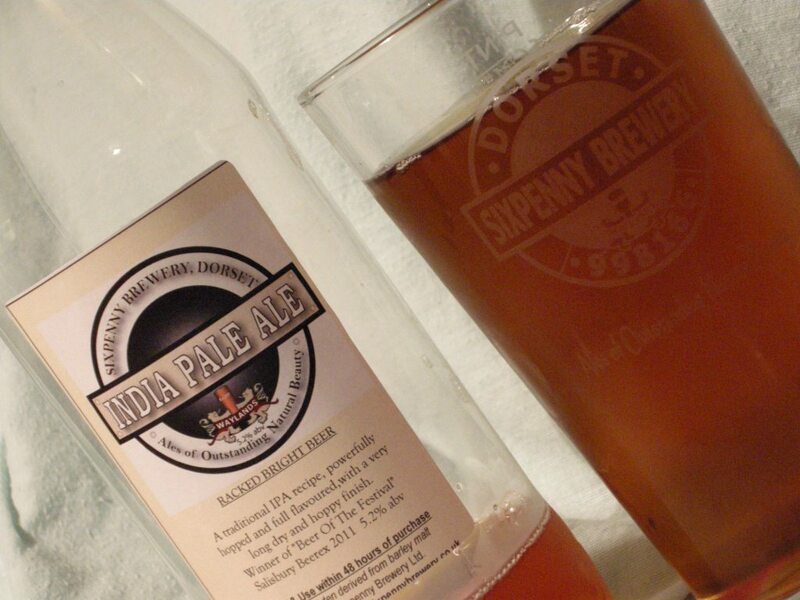 You’re going to have to come to Dorset to get some of this amazing beer though, as Sixpenny tell me most of their customers are within a 20-mile radius of the brewery. Although I can see their beers being perfectly at home, and selling well, on the bar at The Rake, The Euston Tap or at Cask, were there a will and logistic possibility of getting them to London, and of course I am trying to persuade pub landlords closer to (my) home in Devon to get some in. Both the beers will also be at CAMRA’s Dorchester Beerex this weekend, although I hear it’s sold out so maybe I shouldn’t be telling you as if you haven’t already got a ticket you’re going to be disappointed. I’ll add insult to injury by also telling you what’s on my Beerex hit list (other than more of Sixpenny’s beers of course!). Art Brew’s Monkey IPA (6.4%) “packed with spicy American Chinook hops” sounds like a goer – and as their Lemon beer tickled my fancy at my last Dorset beer festival I have high hopes for it; because I’d not heard of Hallertau hops before I’m interested in a trying a drop of Dorset Brewing Company’s Yachtsman (4.7%), and I’ll also be looking out for Yeovil Brewery’s Stout Hearted. All of which is being made possible by my partner, The Man, who has generously agreed to be the designated driver. My hero! Assuming that lot lives up to my expectations, watch this space for when I report back. Previous Christmas Ales – what’s that all about then? This all sounds good. I’m down in Dorset my self in a few weekends time to visit my Dad. I’ll be checking out Yeovil brewery and maybe even Sixpenny. I even hear that Sherborne, my home town, has a brewery again. can’t wait to see what they are doing.